In Mexico City’s daily life — in the shops, taxicabs, cafes and lines waiting for the bus — one could hear conversations between people of all ages saying that Enrique Peña Nieto would, without a doubt, win the presidential elections. “Either something huge will happen,” a taxi driver told me, “or he will win.” And when people referred to “something huge happening,” they were referring to violence, or some unbearable crisis. But it hasn’t happened like that. Far from anything originally expected, it is the Mexican youth and university students who are doing “something huge.” They have altered the political agenda in the country to prove that no one wins an election until the election itself. The gathering began on May 23 at the Estela de Luz, or Pillar of Light — a monument that has caused much controversy due to the billions of pesos the government invested in its construction. The students appropriated this symbol of corruption to illuminate it with their democratic demands in a key pre-electoral moment. With only 40 days left in the race, the protest was provoked by the manipulation of information and the imposition of a candidate by corporate and media elites during the hype of the electoral campaigns. In the end, 20,000 students from universities both public and private marched for four hours along the main avenues of Mexico City. The protests that followed have sparked talk of a “Mexican Spring,” making reference to the uprisings that began in North Africa at the end of 2010. The principal demands of the students coincide with the last point of the National Pact for Peace that Javier Sicilia proposed at the Zócalo in downtown Mexico City on May 8, 2011, when the MPJD was just beginning: political reform, a representative democracy, the democratization of the media and state policy that breaks with the monopoly of the media — a policy that will generate competition and make public media stronger. In this sense, it seems as though the movement that had its first anniversary on March 28 has found in these students and youth allies for rebuilding the social fabric of Mexican society. The story started two weeks ago, on May 11, during a meeting with Enrique Peña Nieto, the presidential candidate of the Institutional Revolutionary Party (PRI) at the Iberoamericana University (Ibero), one of the most prestigious private universities in the country. Students admonished the candidate who aspires to be Mexico’s next president, thereby returning hegemonic power back to the PRI, which lost 12 years ago. They shouted “Coward!” and “Ibero doesn’t want you!” and “Assassin!” — reminding the candidate of the brutal repression he ordered against the farmers and florists that mobilized in San Salvador Atenco in 2006, when he was the governor of Estado de México. This repression, in which two young men were murdered, 350 people were detained — including 10 minors — and 26 women were raped, was one of the most violent episodes during his mandate. Trying to avoid a scandal in the media and attempting to protect his image as a candidate in the face of the student’s disapproval, the PRI accused the students of being agitators paid for by the candidate of the left, Andrés Manuel Lopez Obrador (AMLO) of the Party of the Democratic Revolution (PRD). The media duopoly that dominates 95 percent of television concessions in Mexico — Televisa and TV Azteca — followed the script by not giving visibility to the student protest against the candidate that the two have already determined will be the “winner” during the electoral process. Three days later, 131 students posted a video on YouTube in which they identified themselves with their official student ID cards and assured viewers that nobody had paid them to admonish Peña Nieto. In the video, the students insist that they do not belong to any political party and express their disapproval of Peña Nieto and the evident manipulation of information. The video has been viewed over one million times to date. Now, youth from other universities have decided to support the Ibero students who exposed the relationship between Peña Nieto and the media elites and the lack of fairness and equality in the political campaigns. 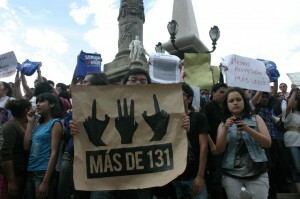 They adopted the name #YoSoy132 (or #IAm132), because they united “in conjunction” as one more. Thus, a student movement with its name in the form of a hashtag was born. It extended itself on the web and became a worldwide trending topic for over six days. 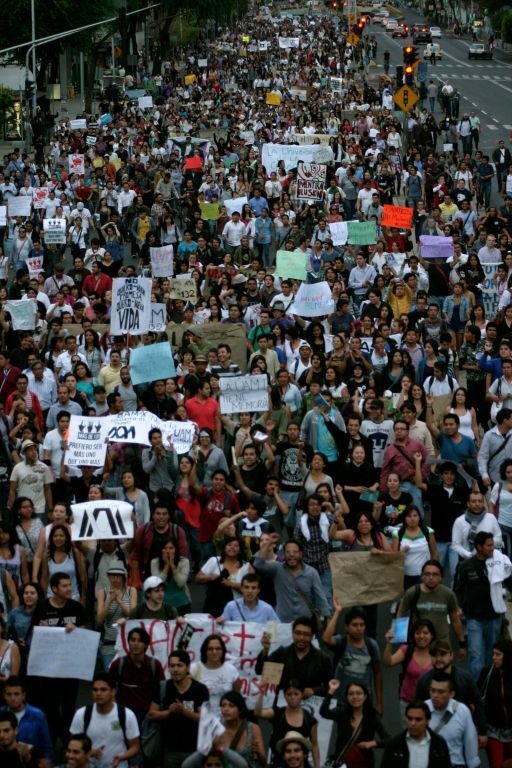 The movement called for massive mobilizations on the streets of Mexico City, such as the march led by students from four main private universities — Ibero, Anáhuac, Tecnológico de Monterrey and the Instituto Tecnológico Autónomo de México (ITAM) — on May 18. They held a rally in front of the various Televisa offices demanding “transparent, plural and impartial information that promotes critical thinking” and does not favor any single candidate. With no relation to the youth of #IAm132, 45,000 people marched against the PRI’s candidate Peña Nieto in downtown Mexico City the following day, according to official estimates. No movement or organization took responsibility for the gathering; it was born out of social networks. As people joined the protest, the students decided to march along Paseo de la Reforma (one of Mexico City’s main avenues) to the monument of the Angel of Independence. Once there, spontaneously, some of the protesters decided to continue to the main headquarters of TV network Televisa to demand the transmission of a second political debate on June 10 by the candidates on national television. 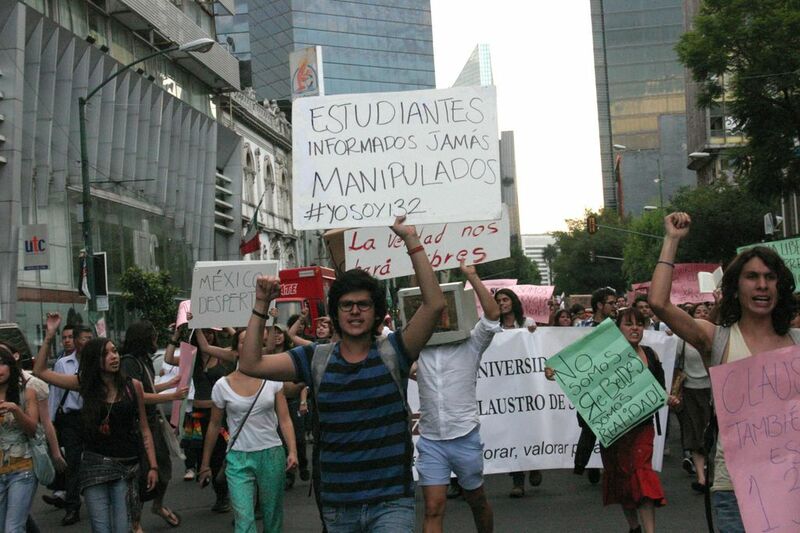 Another group of protesters continued the march to the Zócalo in the centre of the city capital. During the march, the demonstrators chanted, “We don’t want a soap opera of a Democracy” and “October 2 isn’t forgotten,” in reference to the day in which the Mexican government tried to dismantle the student movement of 1968 — killing hundreds, according to independent investigations. There were also demonstrations in other states on the country: in Oaxaca, Jalisco, Morelos, Querétaro, Yucatán, Michoacán Hidalgo, Chiapas, Baja California, Puebla and Estado México. The students have called a general assembly for Wednesday, May 30, in which representatives from each university will work on their collective proposals. Has the Mexican Spring arrived? The students wanted to demonstrate that no one can win the presidency before an election takes place. They ask for the truth. This is the self-expression of a generation that is challenging the assumed victory of a presidential candidate 40 days before the elections. They are playing their role as revolutionaries, as agents of change and of moral force. These students know that social media can be a space where they can participate as free and independent citizens and can serve as a counterbalance to the discourse of the powers that be, including the media duopoly. “We are party-less. We are not favoring any political party or candidate and we want the media to open up, to stop lying,” said a student at Universidad Nacional Autónoma de México (UNAM). They are party-less but not apolitical. The supposed apathy and individualism and by which the Mexican youth have been characterized has been disproved on the streets and on the web. The budding movement intends to organize itself, to create ties between the different universities, to elaborate collective proposals and to develop a more concrete political organization. Only after this happens can we start talking about a Mexican Spring. Javier Sicilia is right. The war on drugs must end, the violence must end, justice must be granted to the victims. He is also right that global systemic change is needed, as a prelude to a new civilization, with new values. The youth, whose future is being stolen from them want it, and hopefully they will get it. Long live to the Mexican Spring! The ‘Russian October’, José Martí, Comandante Che- they have all been surrounded by a golden aura of epic heroism and romance; however an outdated paradigm of governance dooms true freedom fighters to failure before they even start, and yet again everything turns full circle. But why? The development of civilization makes democracy and the humanization of society inevitable. The best minds tirelessly look for a new and effective form of government that would adequately represent today’s changing society. The solution is near and the necessary resources to establish this form of government are already available in society. True Democracy and Liberty is here: A multipolar political system.